This year as a birthday gift my friends arranged for a cooking class, shopping trip, and dim sum brunch at Myers + Chang. What a gift! My friends obviously know me well. It was one of the coldest days this season and ordinarily I'd spend the day at home in my PJs but it was well worth it to brave the cold and a great way to kick off my birthday weekend. 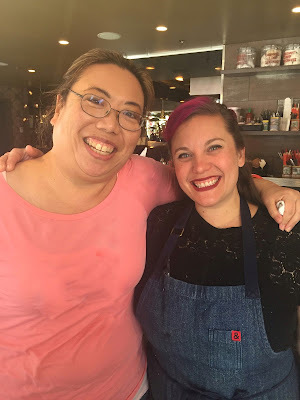 It's not every day that I get to meet a Top Chef contestant and James Beard nominee, much less get to learn from them, but that's exactly what I got to do that morning. Chef Karen Akunowicz is the Executive Chef at Myers + Chang and was our host for the day. She is lovely, so friendly and full of energy. She took us through the process of making the filling, wrapping the dumplings, and cooking the dumplings pot sticker style. All the while she shared stories and answered questions, mincing and chopping like Martin Yan. And Chef Karen told us with great confidence that by the end of class we would be dumpling ninjas. One thing I learned is with this filling there is no binder like bread crumbs or eggs or even cornstarch. The binder comes from working the filling well so the fat in the pork breaks down and serves to hold the mixture together. And unlike a meatball or meatloaf, you don't have to be careful about overworking the filling. Chef Karen showed us a technique where she used her hand like a paddle to mix and blend the ingredients together. I found this video on YouTube which shows a number of the dumpling folds we learned along with a few others. Fold #2 is what my sister excels at when we make mundoo (I have yet to master it). Folds #3 and #5 are similar to ones we learned in class. And as the video host says (paraphrase), it doesn't matter what they look like, they're all going to taste great. Chef Karen also showed us how to get the amazing crispy crust when she prepared the dumplings pot sticker style. I love pot stickers but in my kitchen with its lack of ventilation and the tendency for the smoke alarm to go off, it's unlikely I'll make them that way at home. In fact, the next day we steamed our dumplings. It took about 25 minutes. We wanted to be sure the filling was fully cooked. After a quick trip to the Asian grocery store to check out the different ingredients used that morning, we went back to the restaurant for a dim sum lunch. The menu included, among other things, green papaya salad, hakka eggplant, nasi goreng, smoked mushroom lo mein, vegetable dumplings, salt & pepper calamari, and a waffle sundae. And the meal ended with a trio of delectable coconut cream tarts and a Happy Birthday serenade. Thank you to my friends for a super memorable birthday (and for many of the pictures in this post). It was a fantastic way to spend a cold Saturday morning. I loved every moment of it! Slice the cabbage thinly, place in a large bowl and salt generously with about 1-2 tablespoons of kosher salt. Let sit for 10 minutes. Mix together pork, ginger, garlic chives, sesame oil, and soy sauce. Squeeze cabbage to take out all of the water, add to pork mixture and mix well. The fat from the pork serves as the binder for the filling (rather than using eggs or bread crumbs). This is done by breaking down and incorporating the fat into the mixture. Make dumplings (dumplings may be made in advance and frozen tightly wrapped**). 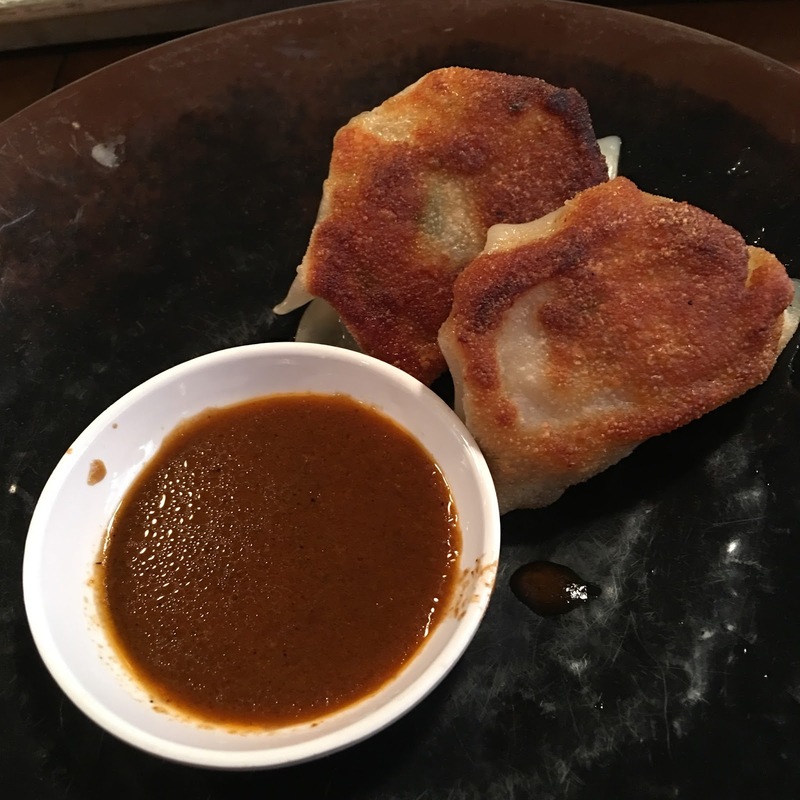 To cook dumplings as pot stickers***, place oil in a large flat skillet and heat on high. Add dumplings and immediately turn down to medium low. Cook, checking bottoms of dumplings, until golden brown. Add about ¼ cup water to pan and cover immediately (be careful as the water will can sputtering and steaming). Let cook for a few minutes and add another ¼ cup of water when the water evaporates. Cover and cook again. Add one final ¼ cup of water and cover and cook again. Dumplings are done when the water totally evaporates and the bottoms are brown and crispy. Serve with dumpling sauce. To make dumpling sauce, mix all ingredients together. Sauce may be made in advance. *We learned a different dipping sauce in class but I don't see it published in other places and I don't feel comfortable posting it without permission. **Thaw dumplings and then cook as instructed.